The Rue Bonsecours is one of the oldest streets in Old Montreal, Quebec with a range of 17th to 19th century buildings adorned in French architectural styles. Outside a restaurant, the night lights illuminate the facades of the buildings, with each one having a different type of sign advertising their business. In 1758, the Rue Bonsecours was a small street in front of chapel Notre-Dame-Du-Bon-Secours, which was eventually widen in 1823. In 1876, the street was named the rue Saint-Victor until its official name change in 2001 to the Rue de Bonsecours to take after the chapel Notre-Dame-Du-Bon-Secours. 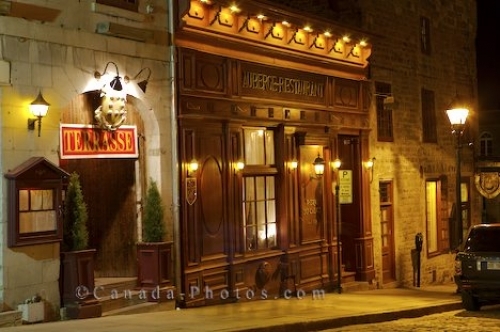 Picture of the night lights highlighting a restaurant along the Rue Bonsecours in Old Montreal in Quebec, Canada. ... , Quebec and each restaurant becomes fairly busy during the summer months. The daylight hours are filled with shoppers who browse through the unique boutiques while night settles down and people come to enjoy an elegant meal at one of the many restaurants. Restaurant along Rue Bonsecours at night in Old Montreal, Montreal, Quebec, Canada.